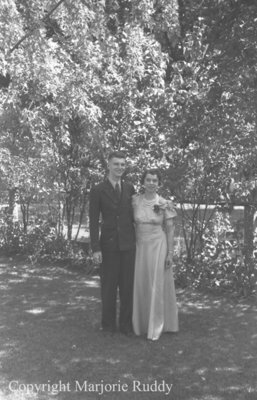 Black and white negative of Douglas Astley and Louise Coleman standing in front of trees. Mr. Astley is wearing a suit and Ms. Coleman is wearing a long gown with a corsage pinned on the gown by her shoulder. Douglas Bruce Astley is the son of George Douglas (1879-1938) and Eva Ellen (Jarrett) Astley (1897-1990). Douglas married Barbara Louise Coleman on 5 June 1943. Mr. Astley joined the Royal Canadian Navy in 1942 and was promoted to the rank of Lieutenant in 1944. Douglas Astley & Louise Coleman, 1941, Marjorie Ruddy. Whitby Archives A2013_040_915A.